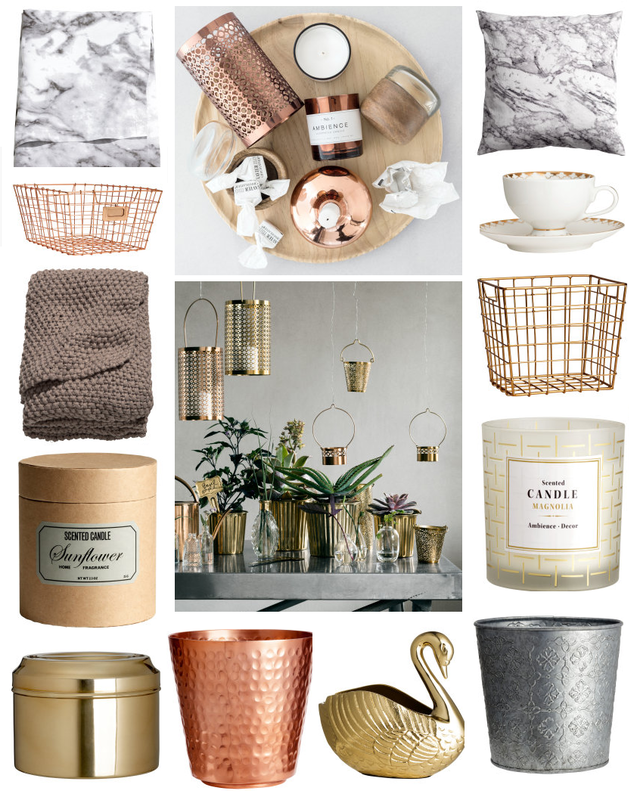 Like most other bloggers, I love a bit of copper. I don't know what it is that makes it so aesthetically pleasing. Maybe it's the fact that it goes with pretty much any colour and adds warmth to a room. As does gold. This gold pot is screaming to be filled with rings. And the hanging lanterns... just wow. I haven't really thought too much about a colour scheme for the kitchen just yet, but seeing this marble table cloth and cushion, I feel inspired. Back here I talked about how I was after a throw to replace the festive out-of-season one I still had on my bed - and I think I've found it! It's difficult to decide out of the grey or "mole" (a mocha sort of colour) but there is something about "mole" that is drawing me in. As is this sunflower candle. I imagine it must smell like summer. And just look at their magnolia candle - it's too beautiful. Although their recent addition of this marble candle is a close competitor. H&M do some really good looking candles and I honestly do believe that appearance wise, they could easily compete with those high end candles you always see in the background of people's Youtube videos! Another blogger must-have is the statement tray. The sort where you see beauty products / flowers / food / jewellery artistically arranged on said tray. I've seen immaculate photos of marbled mini dishes filled with rings and copper offerings, but this wooden tray had my name all over it. And let's not forget a couple of other quirky extras that caught my eye. Like this patterned pot which would be only too easy to fill with flowers. And that swan though. At first glance you'd think it was an ornament, but it's actually a bowl - multi-purpose item right there! H&M are offering free P&P at the moment if like me you are tempted! You have until 7th April to enter the code 2946 at checkout. Also some of the above items are up to 50% off for a limited time only - so well worth a look! Have you ever bought anything from H&M home? Oh I haven't been in there in a while but they did have some lovely stuff when I last went in. I do love a bit of copper. You're right, it's the warmth.